The Flour Bluff Business Association held its regular monthly meeting at noon on March 8, 2017, at Funtrackers in Flour Bluff. 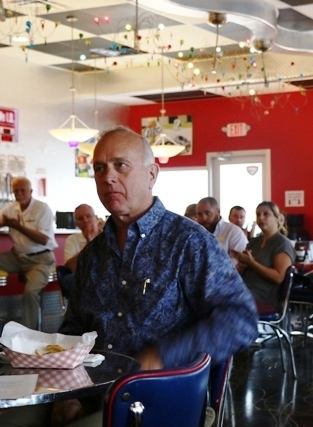 A crowd of about 40 small business owners and government officials listened as Pct. 4 Nueces County Commissioner Brent Chesney updated the group on issues at the county level. In closing, Chesney and Pct. 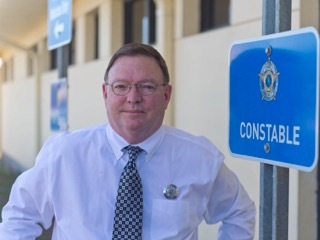 1 County Commissioner Mike Pusley awarded the association a total of $4500 as part of a program that allows each commissioner to distribute funds for community development as they see fit. Chesney contributed $2500, Pusley $1000, and County Judge Loyd Neal $1000. Chesney opened his talk by recognizing the various entities in Flour Bluff that help the community thrive. He was especially complimentary of the students, staff, and programs of Flour Bluff Independent School District, saying, “There’s none finer than FBISD.” He went on to describe how proud he was of Coach James McMinn, his friend and former high school teammate, and the FB girls basketball team for winning their way to the final 4 of the State Girls Basketball Championship. Chesney said it was thrilling to attend the game in San Antonio. “It was fun to be there. And, what a great student body! Those kids were so well behaved and so fired up. You should be very proud of the Flour Bluff School District; they really do a great job.” He was especially happy to announce that the county health fair held at FBISD was a success and something he hopes to continue in the future. Chesney handed out other accolades, as well. He complimented Melanie Hambrick for her efforts in cleaning up Redhead Pond on Laguna Shores Road with Friends of Redhead Pond saying, “This is a project that is special to me and that I’ve been involved in, but Melanie is the one who really got this thing going and is doing what Melanie does, just going after full force.” He thanked the Flour Bluff Citizens Council, a local advocacy group formed in October 2016, for keeping the people of Flour Bluff people informed and pointed out that he became a lifetime member to show his support for the group. Chesney thanked Monette Bright for her work with Operation Graduation, a program he personally supports through contributions. He also thanked Jeff Craft of The Flour Bluff Messenger for allowing him to write a column to keep people apprised of what the county is doing with taxpayers’ dollars. Chesney told the group that coastal parks in Nueces County are now on the short list for millions of dollars in grants from the BP oil spill and that Padre Balli Park and I.B. Magee Park in Port Aransas are expected to receive $7.5 million in funds from the Restore Bucket 1 grant program. “These dollars will be used to increase and improve the coastal parks, which will help you.” Chesney pointed out that the coastal park is one of the few revenue-generating areas of the county and that the $7.5 million will give the county a ten-year jump-start on their master plan. “Mr. 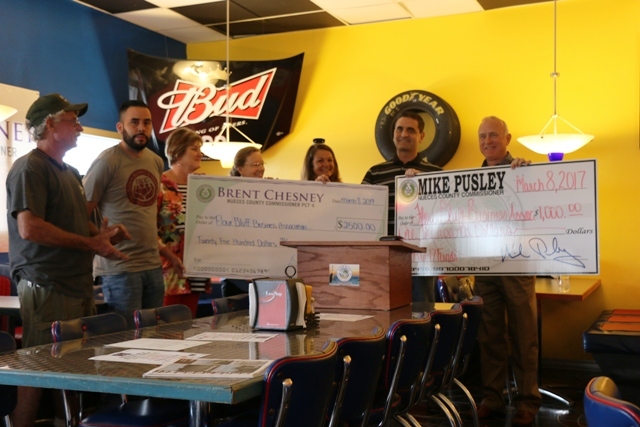 Pusley and I are always looking for ways to generate revenue for county projects that benefit everyone in the county – without increasing taxes,” which Chesney pointed out is one of the most effective ways the County can serve the people of Flour Bluff. Chesney and Pusley addressed the ongoing issues with ADA compliance at all county buildings. “It’s important that we make our facilities accessible to all. We just want to see some flexibility if – let’s say – a ramp shifts a quarter inch, and it’s no longer in compliance,” said Pusley. Pct. 4 County Commissioner Brent Chesney receives Certificate of Appreciation from FBBA President Jennifer Welp, March 8, 2017. New members: Julie Armstrong of Cubit Contracting and Neal Ekstrom of NCE Waste Environmental Services were accepted as General Members; and Misty Svoboda of Berkshire Hathaway Home Services Real Estate Center was accepted as an Associate Member. 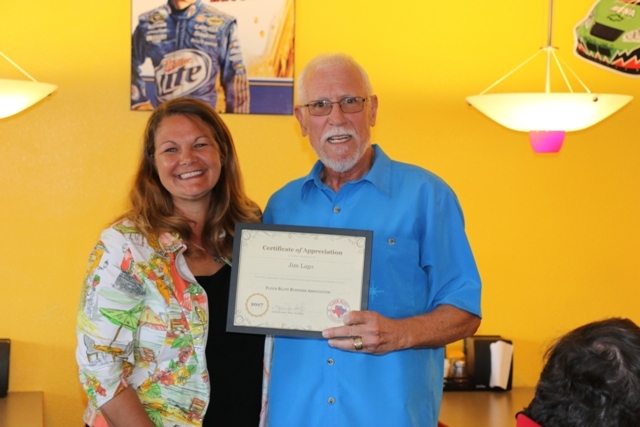 Introduced as a man “whose voice you probably know better than his face,” award-winning radio personality, Jim Lago, addressed the Flour Bluff Business Association at its regular monthly meeting held February 8, 2017, at Funtrackers in Flour Bluff. Lago, a recent inductee of the Texas Radio Hall of Fame hosts “Lago in the Morning” each weekday from 5:30 to 9:00 a.m. on KKTX 1360 in Corpus Christi. 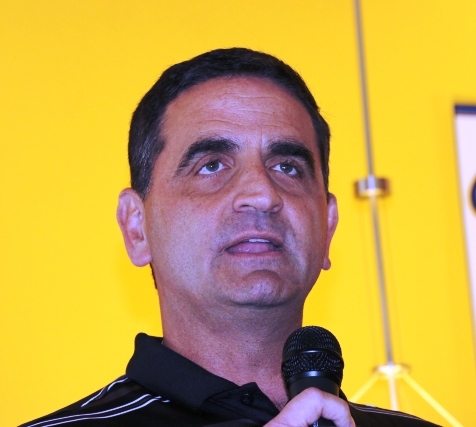 Known for his gift of gab on a host of subjects, Lago spoke on many topics, most of which focused on the unique history of the Flour Bluff community, including its struggles with the city and its connection to NAS Corpus Christi. Lago, a former resident of Flour Bluff from 1987 to 2005, said he always liked living in the Bluff primarily because of the “maverick attitude” that the people of Flour Bluff possess. He told a few stories from his old neighborhood of Turtle Cove, including one that spoke to the issues that still exist in Flour Bluff parks due to neglect, something that the business association and Flour Bluff Citizens Council are working to change. He spoke of how the history of the area is often neglected in the media, as well. He was speaking about Flour Bluff being chosen as the place for NAS Corpus Christi in 1940. Lago reminded everyone of how the relationship between the city and the base should be valued and protected. “They say that when you see a government entity open in your town, you’re one day closer to seeing it close.” Such was the case, he pointed out, with Homeport in Ingleside, Texas, and could be the case for NAS Corpus Christi at some point. The popular radio host went on to relate the history of the Battle of Midway in WWII led by Lt. Cdr. John C. Waldron, for whom Waldron Road was named. Lago expressed his concern that this piece of American and Flour Bluff history should be more highly publicized and memorialized. He suggested that the FBBA invite Captain F. W. “Rocco” Montesano, USN (Ret. ), Executive Director, USS Lexington Museum on the Bay to tell the story of Midway, Waldron, the Lexington, and how Flour Bluff and Corpus Christi were affected by them. Lago commended those young Navy pilots who have worked and given their all to show everyone what American Exceptionalism really is. He compared the actions of these young men and women to those who have been rioting and wreaking havoc on the Berkeley University campus. Lago described an “aura of leadership” that he has observed in those who have graduated the US Naval Academy in Annapolis, Maryland. After relating a few more local stories and making a few jokes about former Mayor Dan McQueen, Lago thanked the FBBA for asking him to address the group. 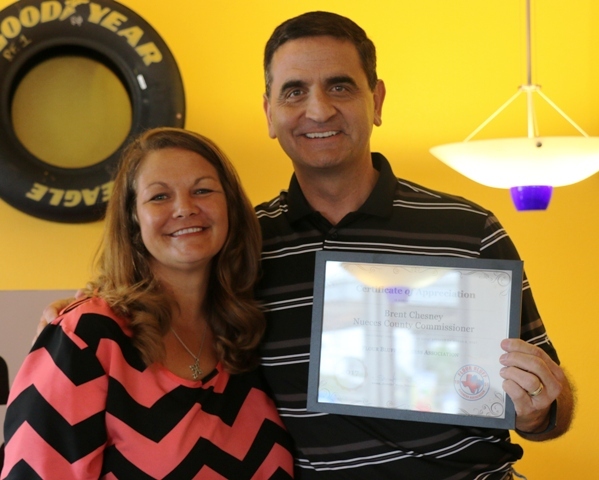 FBBA President Jennifer Welp returned the thanks and awarded Lago with a certificate of appreciation. 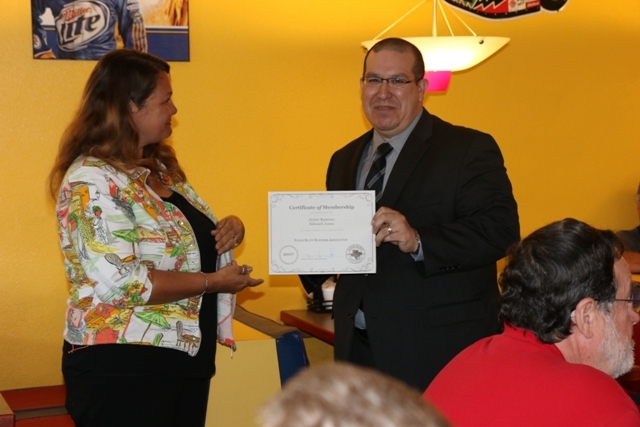 Javier Ramirez, Financial Advisor for Edward Jones, was welcomed as a new member. Javier’s office is located at 10241 S. Padre Island Drive, Suite 135, Corpus Christi, Texas, in the offices facing Waldron Road. The next FBBA general meeting will be held on March 8, 2017, at noon, at Funtrackers. County Commissioner Brent Chesney will be the keynote speaker.